Amazon Music Unlimited vs Pandora, who's the winner? 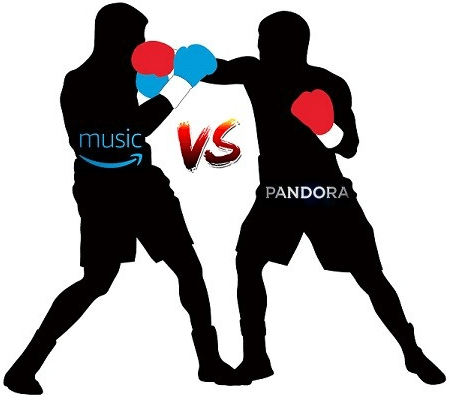 Online Music Store Amazon Music Unlimited vs Pandora, Who’s Winning This Epic Battle? Amazon Music Unlimited vs Pandora, Who’s Winning This Epic Battle? When it comes to music streaming, there are many brands that you may want to choose from. From Amazon Prime Music, Amazon Music Unlimited, Spotify, Tidal, Pandora, iTunes, Apple Music and much, you can find the one site that suits you best. Because of all these services, many people are asking what it the best music streaming services. In this article, we are going to compare and see the difference between two music streaming services, Amazon Unlimited Music and Pandora. When it comes to comparing between Amazon Music Unlimited and Pandora, many people keep asking which one is the best music streaming services. Compared to Pandora, Amazon Music Unlimited offer users more music option compared to Pandora. Amazon Music Unlimited already had a music streaming service Amazon Prime that catered for a Prime customer. But they can now access Amazon Music Unlimited for a monthly fee of 8 per month or a round figure of $$ per year.If you are non-Prime customers, you are required to pay $$ per month. Pandora too offers its users a selection for free but they are limited to the number of times you can skip songs. If you want to skip as many songs as possible, you need to upgrade to Pandora Premium that gives it’s users exactly what they want from Pandora. For Pandora Premium, users need to pay a $10-month fee to access millions of songs. They can also choose songs by skipping the songs they don’t want to listen to. Amazon Music Unlimited is accessible through a web player in your browser, Amazon Echo, and Amazon Music app that can be downloaded on Androids and iOS devices as well as personal computers and Mac. You can also access Amazon Music Unlimited on the Fire TV and Amazon’s Fire Tablet through an app. If you have Roku media streamer or Sonos multi-room system, you can also play music using them. According to Amazon, there are also a few selected BMW and Mini cars that are amazon-enabled and provide access to Amazon Music Unlimited through it’s infotainment system when connected to a smartphone. Pandora is accessible in places such as the United States, New Zealand, and Australia.Pandora can also be accessible on iPhones and iPads using an audio App, Roku, TV, tablets, and other devices. More than 50% of people listen to Pandora on other devices other than their PC. You can be connected to Pandora in your car. From Toyota to BMW/Mini, and Hyundai and Ford by using in-car apps. However, you need to check with your local dealer to see if your car has access to Pandora. Amazon Music Unlimited and Pandora, Which One Has More Music? The Pandora music database holds only a million plus music while Amazon Unlimited offer tens of millions of music to it’s users. Amazon says it has over 40 million songs in it’s playlist with a release for “today’s most popular artists.” Obviously, Amazon has more music compared to Pandora. There are a few quirks that make other people get used to certain music streaming services than others. In the case of Pandora, Pandora Premium doesn’t offer pre-generated playlist, you have to choose songs and create your own playlist. Pandora music streaming services rely heavily on it’s radio station, but you upgrade to premium, it comes without any restrictions. Amazon Music Unlimited comes with no restrictions whatsoever. It has the most benefits than Pandora. Both Pandora and Amazon Music Unlimited offer personalized radio stations based on songs you like and artists you love. Amazon Music Unlimited has the unique ability that can be used by users. Using Alexa, Amazon Assistant, you can ask it to play the music of a certain artist, genre or even according to your mood. Pandora also has good mood-based songs that you can create a playlist for yourself. For Pandora, it’s main strength lies in its ability to help users discover new songs and artists but not a playlist. Pandora also doesn’t have the Alexa meaning you have to create your own playlist if you need one. Both Pandora and Amazon Music Unlimited offer offline playback. You can only download music from Pandora if you have subscribed to their premium services while Amazon offers it as standard. Soon after comparing we are back to our first question, which one is the best? Depending on your test and needs, Amazon Music Unlimited is definitely worth considering. It offers you tens of millions of tracks Alexa assistant and can be played on more devices than Pandora. For those who love to discover new music, Pandora is great for you.